Cardiovascular and Thoracic surgery is the specialty concerned with the prevention, diagnosis, treatment, with specific focus on surgical management, and rehabilitation of disorders that affect the cardiovascular and pulmonary system as well as the other major organs in the thoracic cavity. The department of Cardiovascular and Thoracic surgery was officially inaugurated by the Honorable Chief Minister of Kerala, Sri. Oommen Chandy, on 10th November, 2012. The department of CVTS in MOSC is a part of Kolenchery Heart Institute (KHI).KHI is a “single stop destination” for all your cardiac health solutions. All the advanced gamuts essential for diagnosis, management, prevention and rehabilitation of cardiac conditions in all age groups is arranged under one roof in KHI thus making it a comprehensive cardiac care center. We follow the “Heart Team” approach here-the cardiology / cardiothoracic surgery teams working in close association and healthy interaction- to arrive at the best mode of management for each individual patient. Our team ensures that your heart gets the best possible care. The department of CVTS is fully equipped and staffed to perform the entire spectrum of cardio vascular and thoracic surgeries. We are able to cater to cardiac surgical needs of neonates , children, adults and octogenarians. The core group of the cardiovascular team consists of two senior cardiac surgeons and one senior cardiac anesthesiologist with extensive experience and proven track record in the field of cardiovascular and thoracic surgery with a combined number of more than 22000 cardiac procedures under their belt. The 30 odd member support team consists of dedicated cardiac personnel available 24hrs/day 7 days / week. It includes specially trained and dedicated theatre /ICU/ward staff, cardiac perfusionists, anasthesia technicians, and physician assistants trained and handpicked from reputed teaching and training institutes across the country. This enhances our team effort in giving our patient the best possible outcome following cardiac surgery. Our team is lead by Dr Saji Radhakrishnan Nair, who has completed his MCh (CVTS) training from India’s prestigious institute (PGIMER, Chandigarh). He had his basic medical graduation from TD Medical College, Alappuzha (1987-1993). He did his postgraduation (MS Gen Surgery) from Govt Medical College, Kottayam (1997-2000). The superspeciality training (MCh CVTS) was done at Postgraduate Institute of Medical Education & Research (PGIMER), Chandigarh (2001-2003).He has extensive experience in Cardiovascular and Thoracic surgery and had started his career with Padmasree Dr KM Cherian at SGCVC, Parumala (Unit of KM Cherian Heart Foundation) in 2004. He had worked there till 2010. In 2010 he joined Bharath Cardiovascular Institute, Kottayam as Consultant Cardiothoracic Surgeon. He has vast experience in all types of cardiothoracic surgeries including coronary surgeries (on pump and beating heart), valve surgeries, thoracic and vascular surgeries. His fields of special interest include Coronary Artery Bypass Surgery (CABG) and valve surgeries. His future plan is to start Minimally Invasive cardiac surgery and transplant program. 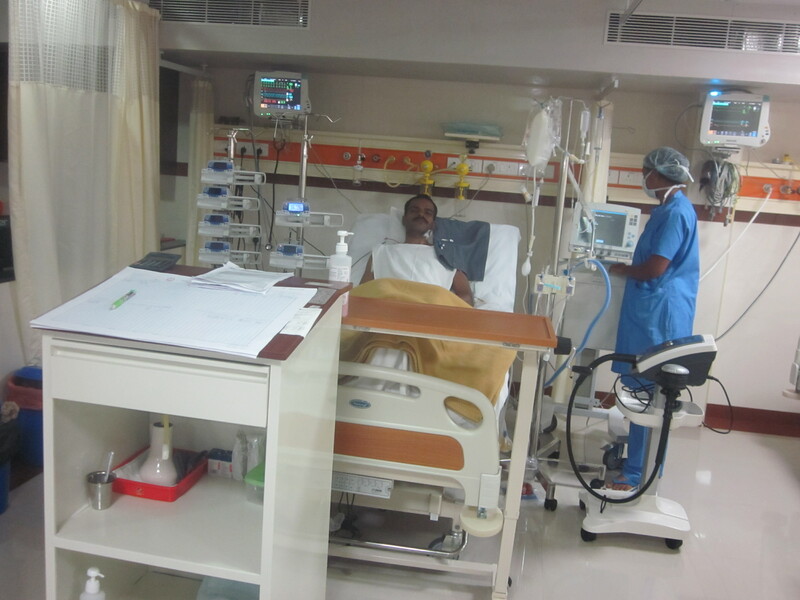 Dr.Sujith Alexander Kurian, working as chief consultant cardiac Anesthesiologist from November 2013. After completing fellowship in Cardiac Anesthesiology from Madras Medical Mission in 2011, joined Amrita Institute of Medical Science, Kochi as Assistant Professor in Cardiac Anesthesia. Later was a consultant cardiac anesthesiologist under Dr. K.M Cherian Heart Foundation in Parumala, Pushpagiri and Chennai. Field of interest complex congenital cardiac surgeries, post operative intensive care of both adult and pediatric cardiac cases. 1. Coronary artery bypass grafting surgery - on pump/ off pump. 2. Palliative and corrective intra-cardiac surgeries for congenital heart diseases in pediatric patients. 3. Valve repair and valve replacement surgeries. 4. Repair of all aortic aneurysms/aortic dissections. 6. Surgery for aorto-iliac disease, femoro-popliteal disease and peripheral arterial occlusive disease. 8. Minimally Invasive (Key hole) heart surgeries –ASD,Valve ,CABG etc. We also provide surgical support for other surgical disciplines in case of poly trauma and take care of the thoracic injuries in the emergency department. 24x7 helpline and email address, for patients to directly contact our staff, for booking appointments, queries and health advice. This is unique to our department. Since the majority of cardiac diseases are “life style” driven, life style modification plays a major role in disease control and prevention. With this important aspect in mind we have specially trained dietician handing out dietary advices to all our patients. Cardiac Rehabilitation Clinic looks into the physical, mental, emotional and occupational recovery of patients following cardiac surgery. The faculty of the department is actively involved in teaching the undergraduate and post graduate medical students. We are also involved in training of paramedical and nursing students, with a batch of BPT students regularly posted in the department every month. General surgery postgraduate students are also regularly posted to this department as part of training. 1. Free cardiac health care camps conducted every month as part of community services. 2. Actively participating in World Heart Day Celebrations on a yearly basis, with associated activities like medical camps and health awareness programme. 3. Actively participating in all institutional activities like Nurses day celebrations, Doctors day celebrations, Infection control programme. 1 .Start a viable and sustainable cardiac transplantation programme. 2. Start VATS and Robotic surgery. 3. Start M.Ch (Cardiovascular and thoracic surgery) training programme. We have a highly sophisticated and well equipped state-of-the art cardio thoracic operation theatre with advanced equipments such as Sarns 8000 Heart lung machine, Datex Ohmeda’s Advanced anesthesia machine, OT table with level sensor, Steris LED overhead light, Philip’s echo machine with real time intra operative TEE monitoring, IABP machine, video laryngoscope, intubating bronchoscope, Continuous cardiac output monitoring system, central monitoring system and imported surgical micro instruments. The theatre also has laminar flow air conditioning system with advanced Hepa filter to ensure maximum surgical sterility in all cardiac operations. We have a fully equipped 10 bedded dedicated post cardiac surgery ICU for intense monitoring and care of immediate postoperative patients. 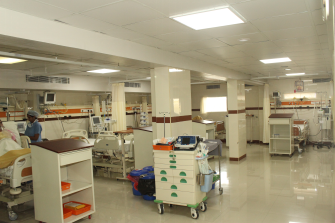 The unit is equipped with 4 Servo ventilators, modular multi channel monitors with central monitoring facility, dedicated portable X-ray machine, ABG machine, Echo Machine, chest physiotherapy unit and patient warmers (Bair hugger). 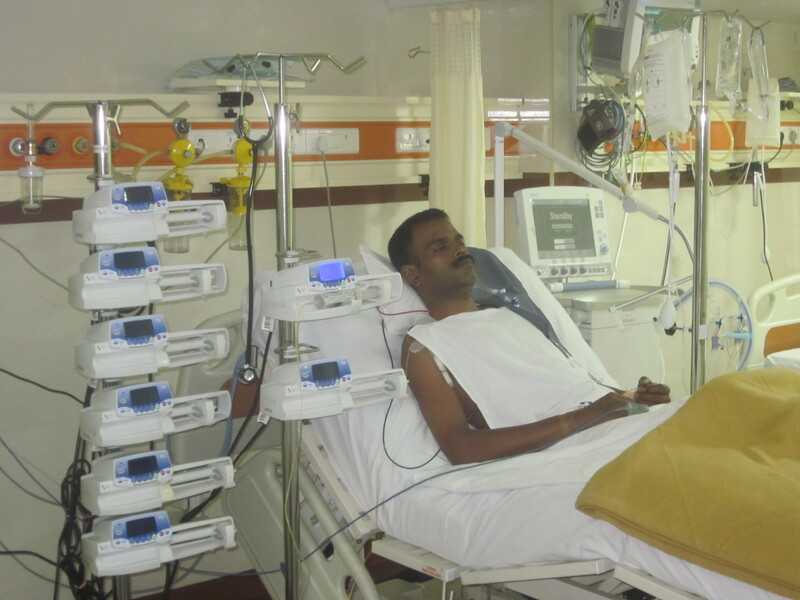 The ICU beds are high quality and fully automated. 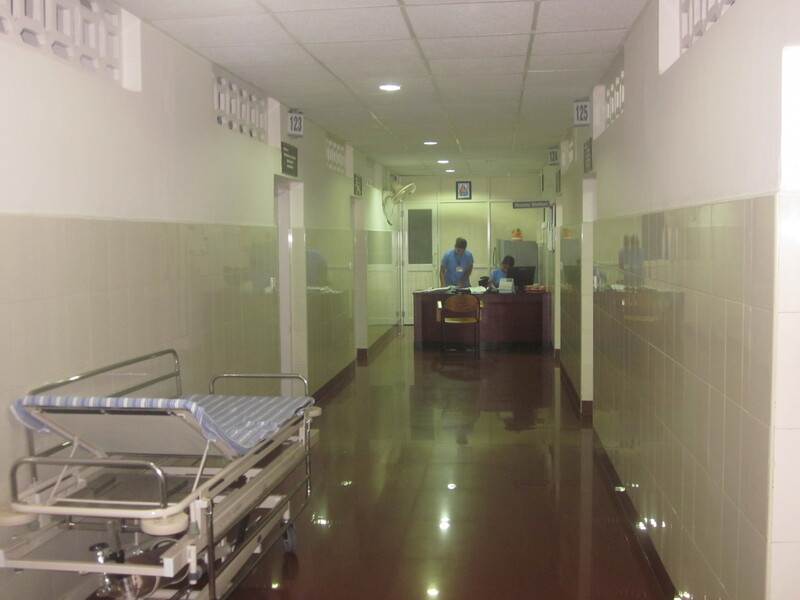 We also have a fully air conditioned cardiac surgery ward and private rooms which caters for both preoperative and postoperative cardiac surgical patients. This ward has been designed as a step down ICU, with options for central monitoring and mechanical ventilation.